Who says fairy tales never come true? Award-winning author Hicks gives the story of "Snow White and the Seven Dwarfs" a contemporary twist in the first book of this hilarious new series. When Suzie Wyatt opens a preschool with seven mischievous students, her neighbors protest. But one, a stuffy bachelor professor, springs to her rescue. Could it be that her prince has finally come? 256 pages, softcover from Waterbrook. Like many people, Suzie Wyatt-the heroine in Book One of the Once Upon a Dream series-wishes that life was like a fairy tale. She admits she's waiting for her prince. When stuffy history professor Harrison Hunt moves in next door, however, Suzie thinks she's been stuck with a toad. And it's going to take seven adorable little imps to help the two open their hearts to one another and to what just might be "happily ever after..."
When fun-loving Suzie Wyatt moves into her parents' home, her dream of running her own daycare center finally comes true. Unfortunately, her new neighbors-the uptight, but handsome Harrison Hunt on one side and crotchety, old Mrs. Pfefferkuchen on the other-cannot be more horrified by the prospect of seven noisy children disrupting the peace. Vivacious Suzie and her seven energetic charges quickly endear themselves to Harrison, however. And Harrison himself manages to capture Suzie's heart. 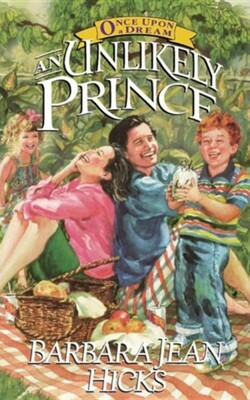 But when Suzie discovers he's joined forces with Mrs. Pfefferkuchen to close her preschool doors, can she bring herself to forgive her "Unlikely Prince?" I'm the author/artist and I want to review An Unlikely Prince, Once Upon A Dream Series #1.